Ole Gunnar Solskjaer has held talks with Paul Pogba and is convinced Manchester United’s record signing is staying at Old Trafford this summer. Pogba has been linked with a move to Real Madrid after admitting it would be a “dream” to play under fellow France World Cup winner Zinedine Zidane. Zidane responded by saying he would welcome compatriot Pogba at the Bernabeu, fuelling suggestions Real are preparing a summer bid for the £89million midfielder. 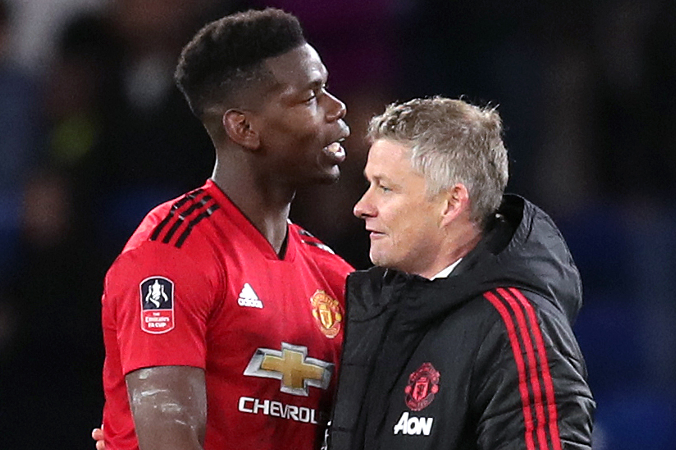 But Solskjaer moved to end any notion Pogba could be on his way this summer, by revealing he has spoken to the 26-year-old about his future and told him he wants to build his United team around him. “It doesn’t really concern me, because my thought of action then is to sit down and speak to Paul,” said Solskjaer, whose United side face Wolves on Tuesday night. “And I’ve had my chat with Paul and we’re fine. He’s going to do his utmost here because he knows I’m very fond of him as a player and a person and he’s important for us. Addressing Pogba’s admission it would be a “dream” to play for Zidane, Solskjaer said: “This is another challenge with international breaks. “Players are available all the time as well and it’s a different environment, more of a general talk. “Paul is a very nice and polite man, who then answered a general question. “Zidane is an icon in France, he’s a fantastic manager, he used to be a fantastic player – I played against him myself – and Paul’s just politely answered that question.